Richmond, BC, April 18, 2011 – Local tour company Indus Travels, who specializes in trips to India and beyond, presented a check of $13,000 to the Heart and Stroke Foundation of B.C. & Yukon in January. The funds were raised in conjunction with their culinary tour to India in November 2010, which was led by celebrity chef Vikram Vij, owner of famous Vancouver restaurant Vij's and author of two books on Indian cuisine. Indus Travels fulfilled their promise of donating $1,000 per traveler booked on their fabulous tour to the foundation. The small group trip exploring India's local cuisine scene was part of their repertoire of "Feel Good Tours," which also includes their "Essence of India" trip, a fully escorted tour of North India benefiting the Royal Columbian Hospital in New Westminster. “By opting on booking these tours, travelers are not only going on a trip of a lifetime but are also giving back to the community," says Praveen Syal, Managing Director of Indus Travels. 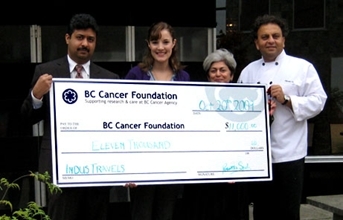 On 20th Oct 2009 Indus Travels presented a cheque for $11,000 to the BC Cancer Foundation- funds raised by through the Royal Heritage Cuisine Tour of Rajasthan led by Chef and owner Vikram Vij of Vancouver’s landmark restaurant, Vij’s. The cheque was presented by Praveen Syal, managing director of Indus travels to Ms. Emily Upton of the BC Cancer Foundation at Vij’s Restaurant.